On May 2, 2009, at age 76, Raymond Curtis established four new American records at the USA Masters Powerlifting Championships in St. Louis. His individual deadlift, squat and bench press weights broke all previous records, as did his combined total for all three events. Ray’s success earned him a coveted invitation to join the United States team at the World Masters competition four months later in the Czech Republic. While Ray did not set another new record at the World Masters last year, he qualified yet again to join the U.S. powerlifting team at the World Masters this year. Now 77, he has powerlifted increasingly heavier weights every year since he was first introduced to the sport. In the last year, he increased his lifts by 100 pounds. 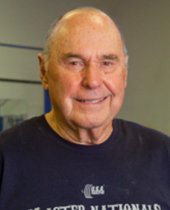 And in case you’re curious… Ray Curtis first started powerlifting when he was 69. Along his way to breaking records, Ray Curtis has shattered some myths about aging and physical performance. Myths like how our bodies will inevitably start to deteriorate in our forties, and that it’s impossible to build muscle mass past our fifties. Ray Curtis is living proof that people can increase their physical strength and endurance at any age, if only they have the will and determination to succeed. And lest you think that Ray’s success might be the result of performance enhancing drugs, you should know that Ray and the Powerlifting Federation are committed to a drug-free sport. Some people will be thrilled by Ray’s success, inspired by the realization that our ability to achieve never wanes. Others might be somewhat concerned at the possibility of losing “I’m too old” as a convenient and reliable excuse for not living life to its fullest. Whether your approach to life is a half full cup or one that’s half empty, it’s nice to know someone like Ray Curtis, who can’t seem to keep his darn cup from overflowing. Ray Curtis… Peoples Health Champion.